Fourteenth century Norway, ten years after the black plague wiped out half of the country's population. In an effort to make a better life for themselves, families are leaving the cities for the country. Signe and her family are on the move across the desolate countryside when they're ambushed by a lawless gang who brutally kill everyone but the young woman. She's taken hostage, for what purpose remains to be seen. This is the set-up for Roar Uthaug's Escape, yet another interesting choice for the director who seems unwilling to be pigeonholed into a genre. He gained international attention with the vacation-gone-wrong thriller Cold Prey which he then followed up with a kid friendly fantasy movie. With Escape the director brings his flare for action to a fairly intense cat-and-mouse chase through the Norwegian countryside. Ingrid Bolso Berdal reteams with the director this time as Dagmar, the unlikely leader of the band of outlaws. She and her men are scraping by, hiding out from the law and taking supplies from those unlucky enough to pass close by. Dagmar opts to take Signe hostage, a choice that makes some of her men very happy and though she tells them to leave the teenager alone, she threatens to turn Signe over to the men if she doesn't behave. When Signe fails to befriend Dagmar's daughter Frigg, it seems as though Signe's fate is sealed. She's tied to a tree and told that the following night she'll be passed onto the men in hopes that she'll become pregnant and give Frigg a little sister. With a little help from Frigg, Signe eventually gets away, but rather than let the girls go, Dagmar is insistent on tracking them down. We eventually find out why she's so hellbent on running through the countryside in search of the girls, a chase that leads to the loss of a few of her men. Uthaug's frequent collaborator, screenwriter Thomas Moldestad, takes what could have a been a vacant action movie and infuses it with a bit of heart, and it works in providing just the right amount of motivation to move the story forward with some semblance of emotional depth. Signe never sets herself up to be a superhero; she's just a girl who can barely take care of herself never mind someone else but when faced with the tough decision of going on alone or returning to rescue her pint size friend, she decides to return for Frigg and in the process, exact revenge for the murder of her family. 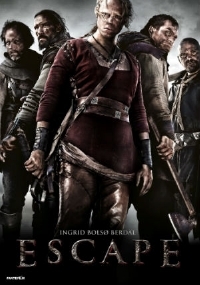 Berdal is great as the hardened leader of the outlaws, herself having once suffered at the hands of others, but the real stars here are Isabel Christine Andreasen and Milla Olin as Signe and Frigg respectively. Olin in particular is wonderful as the smart but scared little girl. For the most part Escape is a typical action drama but one that is evenly paced and which avoids dull moments. The story elements sprinkled throughout are wonderfully mixed with the action to provide a well rounded group of central characters that we actually care about. Combined with John Christian Rosenlund's gorgeous cinematography which captures the lush but harsh setting and Magnus Beite's often dreamlike score, Escape is a great adventure story with a bit of heart. Escape is available on DVD and Blu-ray combo on Tuesday, May 14th. Blu-ray Extras: A collection of deleted scenes, a blooper reel and a visual effects featurette. Please see the definitions of Review and Synopsis.